Product Condition: The Free Short Short - Women's is in Excellent condition. These shorts were previous owned for three weeks. The following observations were made regarding these item. *They were tried on in indoors for an occasion. *There aren't any defects in them at all. *They got minor lint/dust/dirt, cleanable. *All items sold as is, all warranties void. Skip the changing rooms at transitions, and power from one discipline to the next in Castelli's Free Short Short for Women. This sleek short wraps you snugly in Instadry Speed fabric for optimum hydro-and-aerodynamics, and the short length stays comfortably out of the way when you get to the third leg. Featuring a lower waistline and shorter leg, the Free Short Short is ideal for athletes looking to minimize coverage to glide through the air and water at top speeds. When it comes to cycling, the Free Short Short is hard to beat with its traithlon-exclusive Kiss Tri chamois that gives you a bit of sweet relief. 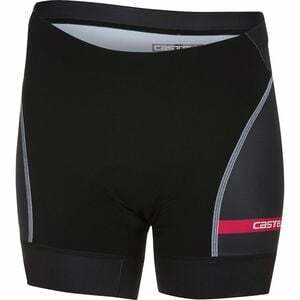 Castelli designed the KISS Tri to work most effectively while your hips are rotated forward in an aero position on the bike while trimming unnecessary bulk to optimize comfort during the run and swim portions of your race. The removal of excess thickness also allowed Castelli to make the pad wider, thus moving stitching away from the more sensitive areas to avoid irritation. A liner on the front of the shorts adds support to make you more comfortable during the run.